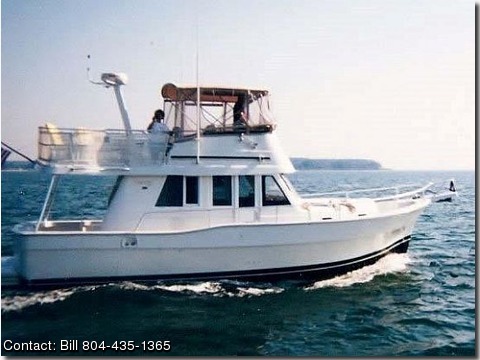 BOAT OWNER'S NOTES for 2001 MAINSHIP 390 Trawler call Boat Owner Bill @ 804-435-1365. The boat's name is Voyager, Professionally Maintained Voyager's electronics are all Raymarine, and are fully duplicated at the upper and lower helms. The electronics include GPS, VHF radios, autopilot, tri-data units showing depth, speed, and temperature, and 24-mile radar, The radar monitors combine the radar "picture" with chart-plotter functions, C-Map chips for the chart-plotter cover just about all of Chesapeake bay and its "tributaries." Amenities include interior cushions, curtains, carpeting, etc, colored white, taupe, and tan, Voyager is equipped with privacy screening for the windshield, and for the flying bridge, The main cabin is equipped with a sofa-bed, so the boat easily sleeps 6 people.